Friends, how do you like your carbs? I like carbs – I like them a lot – but I don’t necessarily like carbs on carbs. Like, a side of garlic bread with your pizza? Weird. French fries and pasta? Weird. Or maybe it’s just me? When it comes to wraps, I find that so often they’re a carb on carb situation… burritos stuffed with rice, and that kind of thing. Although the tortilla is deceptively thin, it packs more of a punch than you might imagine. I’ve been working on these curried cauliflower chickpea wraps for a while now, and I’m pleased to say that they’re pretty much perfect. 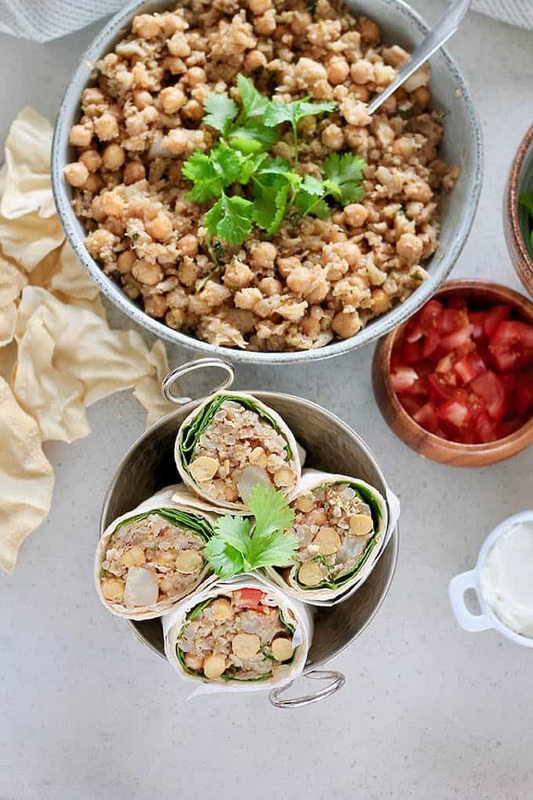 They’re kind of like burrito meets samosa, but we’ve replaced the potato that’s typically in a samosa with smashed cauliflower for a wrap that’s way less of a carb-on-carb situation. 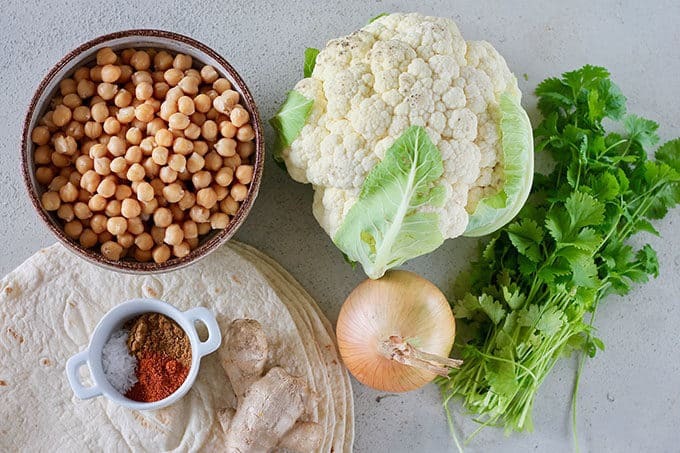 Let’s make some Curried Cauliflower Chickpea Wraps, shall we? What goes into these wraps? That’s pretty much it! It’s actually a super basic recipe when it comes down to it. 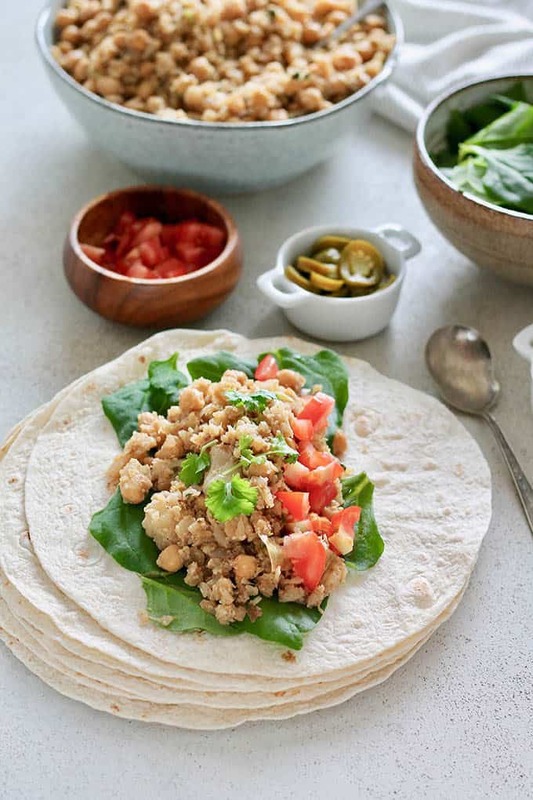 How do you make curried cauliflower chickpea wraps? We’re going to start by mashing the eff out of some cauliflower. Well, maybe not the eff, we do want some texture. But it gets steamed and mashed and that’s the base of things. Then you’re going to sauté the onion in a big pot, and after it gets a bit browned you’ll chuck in the ginger and spices. In goes the mashed cauliflower, the chickpeas, and a good amount of cilantro. THAT’S IT! Your filling is done and you’re ready to roll! Listen, if wrap rolling stresses you out, feel free to freestyle the situation. Or just put the filling and wraps and accoutrements out on the table and tell your people to get off their lazy butts and roll their own wraps. What are you, their mother? It’s entirely possible you’re their mother. If you *are* planning on bulk-prepping these wraps, and in particular if you’re going to freeze them, you’re going to need to brush up on your wrap rolling skills. Here’s a handy wrap-rolling tutorial to get you started. Like most of my wraps, these can be made in advance and tossed in the freezer. That’s where 4/6 of these wraps are right now. To pack them for lunch you simply pull a wrap out of the freezer the night before (or morning of) and when lunch time rolls around you can either eat it at room temp, or remove the foil and give it a quick zap in the office microwave. I’ve served these with a delish garlic yoghurt sauce, which is great for dipping. For packed lunches you can either tuck a small container of the sauce alongside your wrap, or, if you’re freezing the wraps, begin each wrap with a slick of the sauce on the tortilla before the cauliflower filling goes down. The curried cauliflower chickpea filling is 100% vegan and gluten free. If you want to keep your wraps totally vegan, skip the garlic yoghurt sauce I’ve served them with, or replace the yoghurt with a vegan alternative like cashew cream. If you’re gluten free, see if you can get your hands on some nice big gluten free wraps, and you’re in business. Why is there no curry powder in these curry wraps? Excellent question, and one that comes up a lot. Very few authentic Indian recipes actually call for curry powder, the curry comes from in the blend of spices in this recipe. Can this recipe be made gluten free? If you use gluten-free wraps, you’re in business! Is this recipe vegan? It’s totally vegan EXCEPT for the garlic yoghurt sauce. If you’re vegan you can leave that out, sub in plant-based yoghurt, or make a cashew cream instead. You’ve got options! How far in advance can I make this recipe? The cauliflower filling will last for 3-5 days in the fridge. Is this recipe freezer-friendly? You bet it is! Just wrap the wraps in foil or plastic wrap and toss them into the freezer. They’ll be good for up to 3 months. Hey Nutrition Lady, what’s the deal with cauliflower? Chickpeas, aka garbanzo beans, are a super food! They contain about 12.5 grams of fiber per cup, which is 50% of the recommended daily intake of dietary fiber. About two-thirds of the fiber in garbanzos is insoluble, which is great for digestive health, particularly in the colon. The remaining third is soluble fiber, which can help lower our LDL-cholesterol, total cholesterol, and triglycerides; important for cardiovascular health. Chickpeas are notable for antioxidant nutrients like vitamin C, vitamin E, and beta-carotene, but also contain concentrated supplies of antioxidant phytonutrients such as flavonoids and polyphenols. Start with breaking down the cauliflower into large chunks. 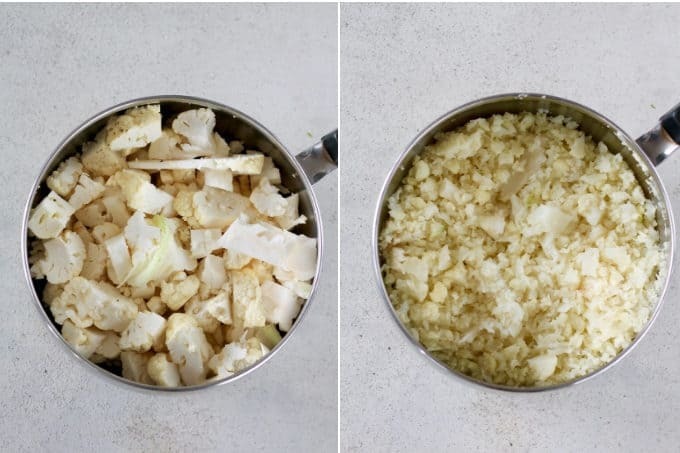 Place cauliflower chunks into a pot, cover with water, add a pinch of salt, and bring to the boil over high heat. Reduce to a simmer, cover, and simmer until cauliflower is tender (but not mushy!) about 15-20 minutes. Drain the cauliflower, and using a potato masher, mash it roughly. There should still be some chunks, but mostly mashed. Set this aside to cool a bit. While the cauliflower is boiling, set a large pot over medium-high heat. This is the pot in which you'll mix everything together in the end, so make sure it's large enough! Add the olive oil to the pot to heat, then add the onions and sauté for 5-7 minutes, until they're just beginning to brown. Add the ginger and sauté for a minute more. Reduce the heat to medium, and then add the salt, garam masala, and cayenne, and sauté for one minute. 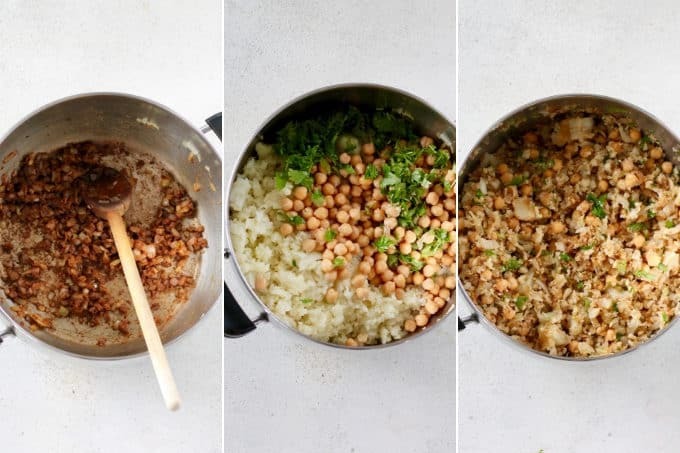 Add the mashed cauliflower, chickpeas, and cilantro and stir well, cooking for 3-5 minutes more. To make the garlic yoghurt sauce (if using) whisk together plain yoghurt, crushed garlic, and add salt and pepper to taste. Spoon about 1/6th of the filling into the center of each tortilla. Fold one side over towards the center, fold the edges in, and roll up like a burrito. Serve with garlic yoghurt sauce if desired. For totally vegan wraps, either leave out the garlic yoghurt sauce or replace the yoghurt with cashew cream or another vegan alternative. If you're making these for make-ahead lunches, either pack with a small container of sauce for dipping, or, when you're making the wraps start with a slick of yoghurt sauce on each tortilla before you add the cauliflower filling. These wraps freeze well. Simply cool to room temperature, wrap in foil, and toss in the freezer for a busier day. This recipe was originally published March 5, 2015. It was retested, re-photographed, and most recently updated on November 9, 2018. 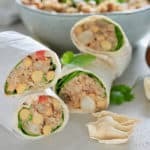 These wraps look and sound so yummy! I just want to bite into one right now. Mmmm! Thanks Genevieve! They really are delish, I hope you try them out! These look delicious! 😀 I’ve been looking for all sorts of excuses to use cauliflower in recipes lately! This is the perfect excuse for cauliflower, then! I hope you give them a try! These look outrageously good! I want one now! Those are definitely super woman feats Katie! Especially the speech giving one. I’ve been asked to speak at an event this summer and I’m already in a panic. What’s your secret? No secret, unfortunately, it’s just something I do. I spent many years teaching and am super comfortable speaking in front of a crowd, so I guess I’m just used to it. And yes, these wraps are outrageously good! So looking forward to my lunch today! They are indeed! I think I was channeling my inner Deena with this recipe. I know you’ll love it! Wow! Your three superpowers are the three things I am the worst at! I don’t think I’ve ever even posted a photo of a burrito in it’s wrapped up form, because any attempt I make at that will be hideous. These look perfect though, and they sound delicious. I’m all about swapping out carbs with cauliflower these days – especially when it’s all gonna get wrapped up in more carbs. I think you’re on to something with photographing them in their unwrapped form, wraps and burritos are sooooo hard to make look good! But this filling isn’t particularly photogenic, so wrapped up was the way to go. And yes to replacing carbs with cauli! It’s the perfect way! These look fantastic! It has been way too long since I’ve had chickpeas and now I’m in the mood! Yeah! 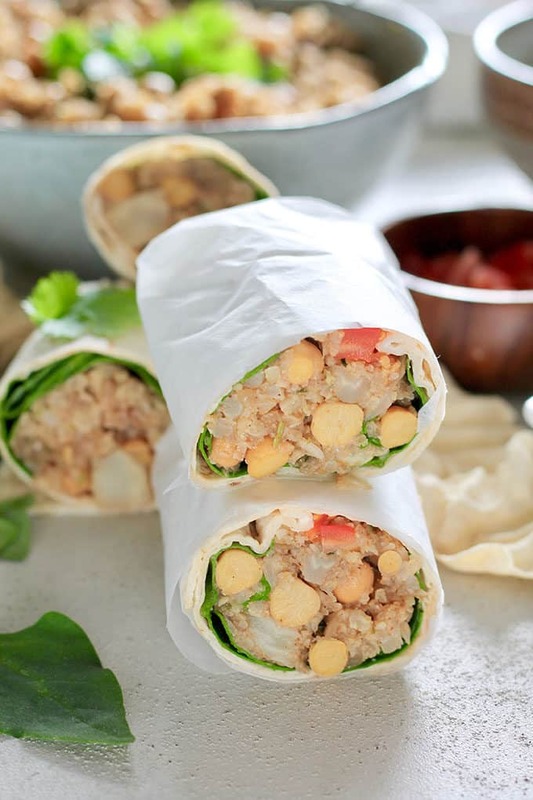 I’m always in the mood for chickpeas, but this spicy cauliflower wrap is especially good. I hope you give it a try! Please do! And let me know how you like them. 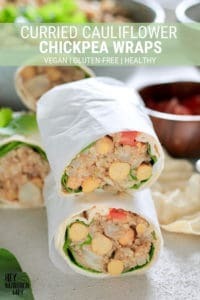 These wraps sound fantastic! I especially like the idea of stashing them in the freezer for future lunches. And also, my secret superpower is the ability to make delicious soup out of, say, water and a potato. 🙂 Super powers for all! Ooooh, that’s a great superpower! 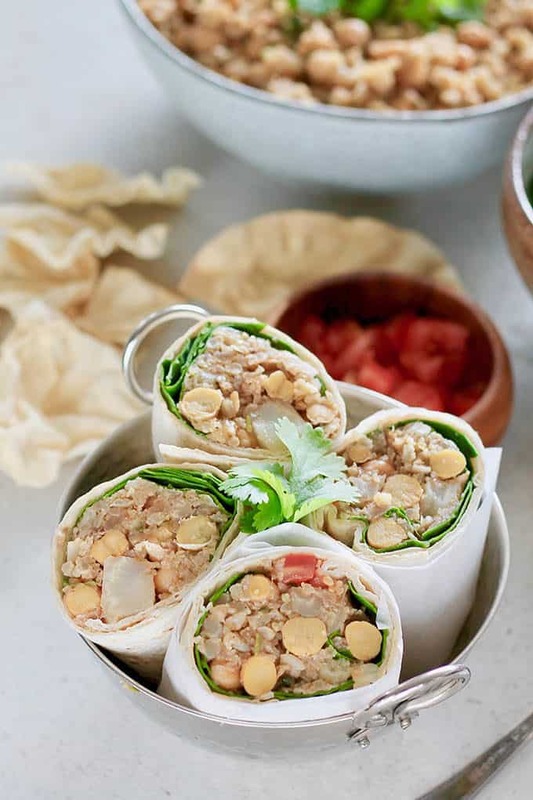 Yes, wraps stashed in the freezer are a lifesaver, especially during a particularly busy week, or if you’re coming back from a trip and need a packed lunch right away. These perfect wraps definitely put any wrap i have made before to shame.. I cannot wrap to save my life, they always fall apart! I must try out your recipe here – they are ideal for me to make for lunch tomorrow. Wrapping definitely takes some practice, but you’ll get it! It especially helps if the filling is a bit on the sticky side, as it helps the whole thing stay together. Let me know if you try these out, I think you’ll like them! Big fan of chickpeas. These would be so yummy to try! I hope you like them, Kelsey! do you have nutritional data on these? They look wonderful, but we have some medical issues we need to address. Hi Nancy, do you mean calorie counts, etc? I don’t provide that kind of information in my posts because I don’t like to encourage calorie counting, but for those who need or want that sort of info, there are wonderful online recipe calculators. Try my fitness pal or sparkpeople. This totally reminds me of what I ate for lunch every,single,day, 5 years ago. I over did it but I think its time for round 2. Ahhh, I hate when I overdo it on a food I really love. Time to get back on the horse. Round 2! This recipe sounds absolutely wonderful, I love the spices! I’ve never thought of adding cauliflower to my wraps, must be amazing! There are some pretty good burrito rolling tutorials online, and it just takes practice! The nail polish and speech giving I have no idea how I do, so can’t help you there. I hope you love these wraps as much as I do! I totally get it! I’m a greens girl myself! Adding kale to these is a great idea. Love these. Making them again using vegan wrap and will steam cauliflower and add what I have. My husband has a potluck lunch tomorrow at work and I had to find a recipe. I stumbled upon this one and decided to make a double batch of it. I also made a garlic cashew cream. Like you suggested, I first drizzled the cream in the wrap and then put the stuffing in it. Holy is that ever good!!! Amazing flavors coming thru and blend perfectly with the cashew cream. I am sure his omni coworkers will never ask if it is vegan and they will devour those wraps! Thank you for the recipe! So glad you liked them, Isabelle! And I’m glad the garlic cashew cream worked out. I sure hope your husband’s coworkers like them as much as we do! I’ve got the last of my batch for my lunch today, and I’ll definitely be making more this weekend. Love these wraps! Wow, I just made these and they are amazing!! Thanks so much for the recipe. Can’t wait to see what else you have posted!! Big tortillas are definitely the key to easy wrapping, but pita pockets sounds like a great idea as well! I made these for dinner last night. So simple, with outstanding flavor! I loved using the cilantro and garam masala. My husband, who hates cauliflower, ate two. Thanks Alexandra! I’m so glad you like them so much. They’re so packed with flavour and good nutrition, definitely one of my favourite make-ahead meals. I made these wraps for lunches this week. When my husband tried one, he said “Oh my god, these wraps are amazing. Best lunch ever!” I agree with him!! The garlic yogurt sauce is absolutely delicious with the cauliflower chickpea filling, and the heat level is absolutely perfect. Thank you for sharing this recipe! We will definitely be making these again!! I’m so glad to hear they were such a hit, Christina! I’m going to need to whip up another batch of my own soon, they’re just so good! Do you need to add any curry to thus recipe? The curry comes from the blend of spices in the recipe. No curry powder necessary! WOW these are delicious!! I halved the spice and mine is still pretty hot – but oh my. What a hit. I have yet put it in a tortilla or added the yogurt mixture as they are fantastic alone. Thank you! Glad you enjoyed them Katie! 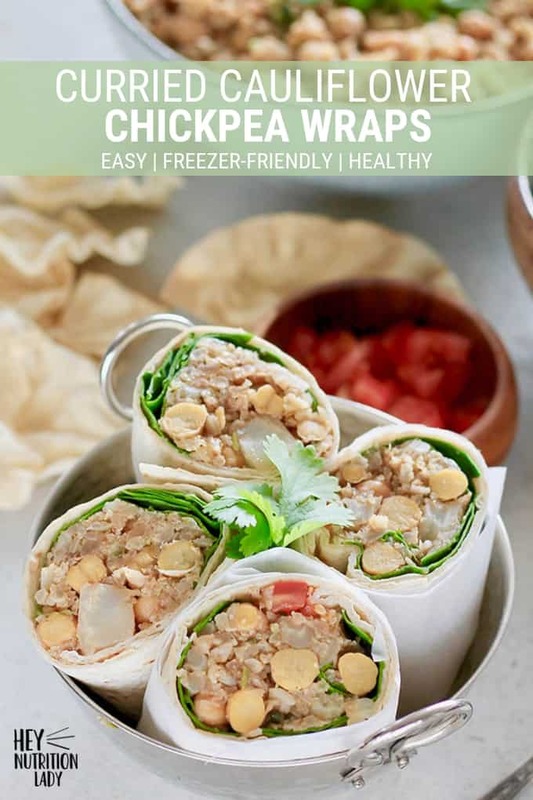 They also freeze like a charm if you wrap ’em up in tortillas, perfect for grab and go meals. Update: These are incredible. We pretty much make these every week. It’s our new staple meal & snack…never makes it to the freezer for leftovers but it’s easy enough to make. And I did add the tortilla & yogurt which puts it over the top. Thanks again & have a happy Thanksgiving! Amazing!!! I doubled the masalas and used tandoori chicken masala instead of cayenne peppers. But these wraps are amazing! Yum! So glad you like the wraps, they’re one of my favourites for sure! Stumbled across this recipe when looking for Sunday meal prep ideas and wow! This is so good! The spice with the yogurt sauce! SO happy I tried this out! Glad to hear it! One of my favourite recipes, especially for weekend meal prep. Yum! Delicious, freezer friendly. Always have some in the freezer for a grab and go lunch option. Hi, if i didn’t want to freeze them, how far in advance could i make this (assuming i dont put it in the wrap until rrady to eat). Would 48 hours be too much? Thanks! Hey Kate, the filling should last you about 3-5 days in the fridge, so you’re good to go! Hi! These look very good. Where is the curry though? The curry is in the blend of spices. Very few Indian recipes actually call for curry powder. Made these this past week. I forgot cauliflower at the store so I used sweet potatoes instead since it saved a trip. They were delicious! It made about 8 of them and I wrapped them in foil and kept them in the fridge. My hubby and I ate them for lunch all week. They were delicious! And we used the left over garlic yogurt sauce to coat our baked salmon for dinner the other night. The only other adjustment I made was using a lont more garlic and roasting it beforehand. Just amazing! Thanks for the recipe! Do you have more like it? Sweet potato is a great swap for the cauliflower, such a good idea! Lots of great (I think) recipes here, check out the recipe archive (https://www.heynutritionlady.com/recipes/) where you can scroll through the various categories. That’s spinach! And it’s in there 100% for food styling purposes in an attempt to break up all the beige. I don’t normally include greens in these wraps, but there’s nothing wrong with adding them if you want. Spinach and kale are good choices if you’re going to freeze the wraps. How do you thaw these? Leave in the fridge overnight or in the microwave? Either! I usually throw one frozen into my bag in the morning and I find it’s partially thawed by lunch time, then I finish it off / heat it in the microwave.